The following Oral History Video was recorded in Gladstone Manitoba in 1996 as part of that town’s Cable Community Access Channel celebrating Canada Remembers. The Commonwealth Air Training Plan Museum has added this video to our Oral History archives. 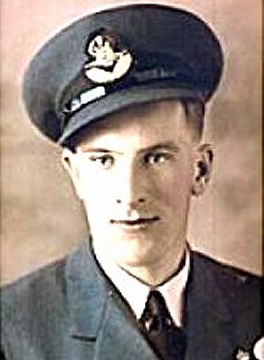 Vernon Watson enlisted in the Royal Canadian Air Force in 1941. He graduated from the British Commonwealth Air Training Plan as a Bomb Aimer with a Flying Officer commission. 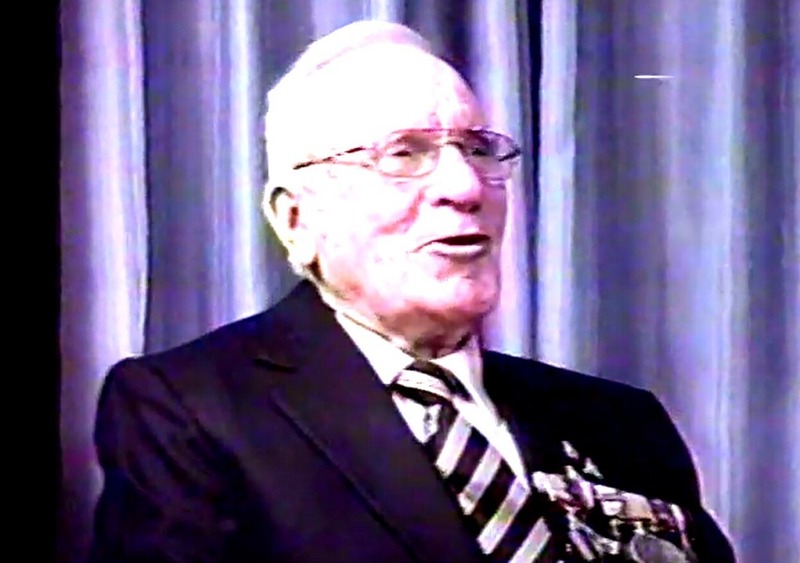 https://youtu.be/7mFZ1DpAtkY After the war, Vernon bcame a member of the Gladstone Legion and the Wartime Pilot’s and Observers Association. Vernon Watson died in March 2006 in Gladstone, Manitoba. 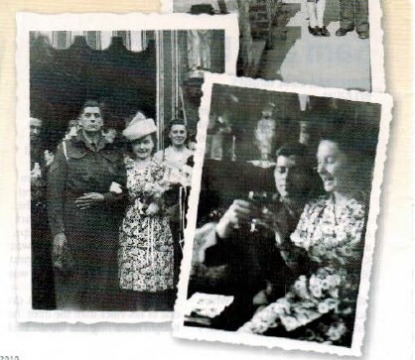 Our Canada Magazine - November 2010 By the end of the Second World War, thousands of British and European women had sailed to Canada as the wives or "war brides" of Canadian servicemen. Here are just a few of their memorable tales. ready to go back to the cellar where we'd been sleeping when we heard footsteps clattering along the pavement. Our hearts began to pound as two soldiers In khaki uniforms approached. Were they Brits? No. Ken and Sam were Canadian artillery troops. Sam asked me a lot of questions. Where had I learned English? Where did I live? What kind of work did I do? I have friends in England, I answered; I live in No. 7 on this street and l'm a teacher. My neighbour mentioned that he was having trouble receiving news from his sister in Ontario, so Sam offered to contact her through his folks back home. Sam would pick up a letter from my neighbour to send the following morning. Over the next few days, Sam and I went to the city centre and walked the streets along the canals. On September 16, Sam asked me to be his girl for keeps, believe it or not! I accepted. He was a handsome, quiet man. The next day, Sam announced his battery was moving out. We began a courtship by mail. On one or his visits from the front, he bought me a ring and we decided Sam to get married as soon as the war ended. Warnings from family and friends about soldiers followed, but I was sold. In the meantime, I returned to work, but not as a teacher. I found a good job with British Civil Affairs and later British Civil Censorship. Our wedding! at city hall in Bruges, the wedding was followed by a small gathering at home. Mother had prepared a small dinner, and there was still a shortage of food. Sam left for Canada and I had to work. The day had finally arrived for me to go to Canada. I travelled from Oostende to Folkestone, England, where I boarded the ship, Aquitania. After six days at sea, with many other war brides on board, we arrived in Halifax, a truly unforgettable sight. But there were no husbands to meet us. We were asked to register and then brought to the train station. I had never travelled in a train with sleeping facilities before. Looking through the window there was nothing but water, rocks and forest. Arriving at Toronto’s Central Station, names were called and I was sent into a long hallway, and there was Sam in civies - a moment I'll remember forever. Toronto was a city out of a dreamland; tall buildings. streetcars and lots of people. We drove to Hamilton, where we were going to live. Sam's sister threw a smull party in her home in honour of our reunion. Sam had rented the upstairs apartmem of a nice little house. There on the table stood a coffee pot, a toaster and a frying pan ready for breakfast! The next day, it was on to the grocery store. I was stunned to see all the goods there. One day we went to visit Sam's parents in Manitoba. That was a real eye-opener for me. Theirs was a lone farmhouse in the middle of nowhere close to the Saskatchewan Border, with no electricity, no running water, an outhouse and lots of land and cattle. We returned home to Hamilton, but later moved to Winnipeg. Moving to friendly Manitoba began the most important period of my life in Canada. I was accepted as a teacher and encouraged to continue my education at the University of Manitoba, where eventually I was offered a teaching position. l stayed at the university until I retired in 1981. Sam enjoyed working in Winnipeg, too. We made a lot of friends there. Upon retirement, we moved to Ottawa to join join our son and his family. We soon got to know many wonderful people in the apartment building where we lived. Sadly, Sam took ill and passed away in 2002. He was laid to rest in Beechwood, the military cemetery in Ottawa, where I will join him when my time comes. and reunited in Canada in I947. I joined the women's Auxiliary Air Force during the Second World War in England, happy to leave an unexciting office job. After an intensive training session, I was posted to a Fighter Command base on the south coast. I was their first female electrician. I first met my future husband, John, a Canadian soldier, in I943 at a services dance in nearby Folkestone. Our meetings always ended suddenly as the "shell warning" sounded and the enemy guns on the French coast opened fire across the English Channel. D-Day brought further separation. We were married in July I945 at a little stone church in the Kent countryside. 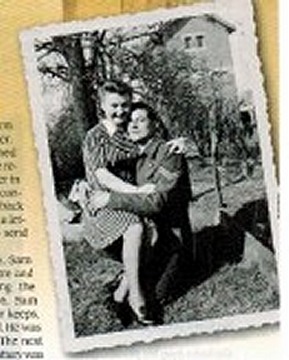 John returned to Canada in January 1946 and I followed a year later with our baby son. We were passengers on the last troop ships crossing of the Aquitania. It was also transporting the final contingent of war brides to Canada. Conditions on board were more crowded than usual. I shared one section somewhere in the bowels of the ship with about 40 other women and children. We were separated from a busy and drafty gangway by a canvas sheet. Sloshing in bilge water, we washed the baby nappies in seawater. The terry cloth squares dried like a bed of nails. No wonder the babies never stopped crying! When a winter storm hit, washrooms became a shambles, baby bottles smashed and frustrated infants lost their usual form of nourishment from their seasick nursing mothers. When the stonn abated, an epidemic of gastroenteritis broke out among the younger children. No treatment was possible, other than to keep them on a glucose solution. A thick fog swept across the Atlantic and swallowed up the ship. The Aquatania finally limped into Halifax harbour way behind schedule. Ambulances took the sick children to the navy hospital HMCS Stadacona. My three-month-old son was among the admitted. The Salvation Army came to the resrue of the stranded mothers. They gave us food, shelter and hot cups of tea. I will never, ever forget their kindness. A week later, we were able to continue our long train journeys across Canada. My destination was the small town of Cochrane, in northern Ontario. The friendly train porters insisted that it was in Alberta, while others claimed that it was at the North Pole! Unknown to me at the time, John had heen waiting in Nonh Bay, Ont. for more than a week with no sign of the war bride train's arrival. Finally, at some ungodiy hour, he poked his head through the Pullman curtalns of my sleeper car. His face was half buried in a huge fur hat with earmuffs. Who is this strange Russian? was my first reaction. This thought was quickly followed by, My God, what have I done? He certainly looked very different from the Canadian soldier in uniform l remembered. Homesickness sent me back to England in 1950. This time, the At!antic remained calm, which was just as well, as I had three little boys in tow! My mother was not well and as she stood waving goodbye to us at the Liverpool dockside, I sensed that I would never see her again - and I never did. Our arrival back in Canada coincided with a train strike right across the country. It took four different flights in small planes to reach an airfield in Iroquois Falls near Timmins, Ont.. It was summer and my in-laws had a cottage nearby. John, along with some family members, other cottagers and even a few dogs turned out to welcome us home. It was wonderful to finally be safely back in Canada. ln 1952, we were blessed with a daughter. Forty three years of marriage to a good and faithful husband came to an end with John's death in 1992. I now live with my daughter in the Muskoka area. The years have gone by, but the memories will always remain. ~ Gwyneth Shirley, Huntsville, Ont. MAY I943, ENGLAND What a lucky day it was when I met my Canadian. It resulted in my coming to Canada and enjoying 62 years of a wonderful life, so far. Joe and I met aboard the HMS Westcliff in May 1943. He was a Canadian naval commando and I a British Wren. He took me ashore on a movie date and I was fascinated to hear all about Canada. 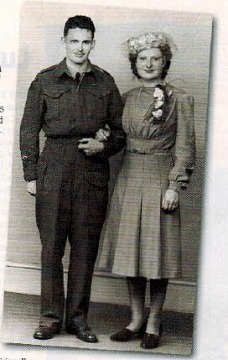 We planned our wedding in August 1944 and we married in December of that year. My first officer had received ten wedding dresses in various sizes for the use of Wrens not wishing to to be wed in uniform -- from a women's group in Texas. All I had to do was pay for the dry cleaning and send a photo to the club of me wearing the dress. Excitement was not the word for my feelings. I chose a gorgeous satin, seed pearl dress with a six-foot train, the likes of which you never saw in wartime Britain! board, I remember thinking that the bread was cake. I arrived at Pier 21 In Halifax, wooden-soled shoes on my feet and strange money in my hands. Park Avenue in Montreal was my destination. Meeting my new family was fabulous. They gave me lots of bridal showers, helped me to learn French and taught me how to cross the road without getting run over! We settled in the Laurentians. My first winter was scary; the snow was so deep I didn't think I'd ever see green again. But I did and still do. My mother, sister and brother eventually joined us. Joe and I had six children and raising them in the relaxed atmosphere of the Laurentians was a delight. I travelled back to England in 1961, again on the Queen Mary. That's when I knew that my adopted country was for me and felt, once again, how lucky I was to have fallen in love with a Canadian. We moved to Calgary and in 1976, I joined the War Brides Club. It was lovely hearing all those different accents once again. I met Bev Tosh, a Calgary artist who was very interested in our group, as her mom was a war bride from New Zealand. She felt that out stories should be told, so she painted more than 50 of us, all on our wedding days, on rough wood canvases, which were then turned into a whole exhibition. The Canadian government helped out and the show has now been seen by thousands of people around the country. I'm very honoured to have my picture in this exhibition. I love Canada and feel truly blessed. Joe passed away in March 1989, but my children are Canadians and have contributed to Canada's wonderful melange. A total of 48,000 war brides and their 22,000 children entered Canada via Pier 21 in Halifax during and after the Second World War. An immigratlon hub since the 1920s, Pier 21 was put under Ihe control of Canada's military in September I939 and became a major war-time link between Britain and Canada. The following two articles are from "The Record," a farewell booklet handed out at No. 7 Air Observation School in Portage la Prairie, Manitoba at the end of the war. The school, which had graduated many Observers and Navigators, became redundant with the cessation of the air war and was closed in 1945. The first article is a detailed synopsis of training offered at No. 7 AOS and how it morphed to meet the changing needs of the Commonwealth Air Forces as the war progressed. The second article gives the reader the "ins and outs" of the first week at an Air Observer School for a new student. Both are interesting reading with the first perhaps, a little lengthy and dry… you be the judge of that. The priceless value of these scientifically trained young men, graduates of the A.O.S., is something which cannot be overstressed. Even the best Pilot in the world, the most deadly-eyed Gunners, the great Bomber and its cargo of sudden-death-to-the-enemy lose all value, as may the lives of the crew, should the young man in the navigator's seat, the Air Observer, be improperly trained, slipshod or inaccurate in guiding the ship to its target and bringing it home again. That is often overlooked by the uninitiated. "The best Bomber Pilot in the RC.A.F. is just as good as his Navigator.'' (Leslie Roberts, "Canada's War in the Air.") At first there were many of "the uninitiated," not least among recruits dreaming of earning their pilot's wings and tossing a single-seater fighter from cloud to cloud. But with the Battle of Britain won, the R.A.F. taking the offensive over Europe, and big and ever bigger aircraft coming off production lines for Bomber and Coastal commands, the spotlight moved away from the fighter pilot to focus on that new unit, "our crew"; on teamwork; and on that: Bomber of the air war, the self-forgetting, each-for-all, air crew spirit. As the importance of the Observer, and then of his specialized successors, the Navigator and Bombaimer, grew in operational experience and in public notice, so too, the training changed. Those first Observer students to enter A.O.S. 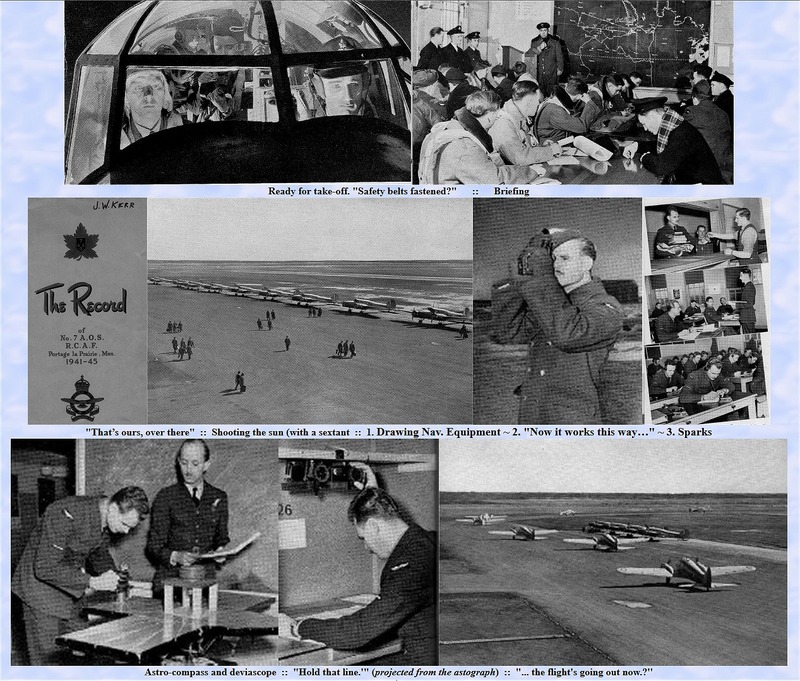 back in the experimental days of the summer of 1940 faced the task of learning what later became two men's jobs; and of learning them in a 22-week course, where each; the combined training of their successive teams eventually totalled 40 weeks. In the words of a 1941 account: "At the A.O.S." the map, chart, compass, bombsight and camera became the student's tools. He learned how to read maps and charts, how to read instruments and correct compasses, how to know what to look for, and how to report it to his crew or his station. He must also learn Morse well enough to receive or send eight words a minute on the buzzer and six on the lamp; learn photography to be able to i:ecord bomb destruction, troop placements, railway networks. "Still another important duty of the Air Observer is to drop the bombs-and that's not just a matter of dumping them out willy-nilly. He's got to be able to plant a stick astride a battleship from more than a mile high and to do so through reckoning against his own speed, the wind speed and the speed of the ship. It is an exact and important science, and packs a thrill all of its own." To master these duties, the Observer spent three months in A.O.S. studying basic navigation-that is fundamental dead reckoning (his central task for the duration), map and chart projection and principles of map reading, compasses and instruments-with aircraft recognition, reconnaissance, visual signalling, photography, and armament; and did 60 hours flying. Then he moved on to a Bombing and Gunnery School for six weeks, to learn in theory and practice how to handle the Vickers and the Browning machine guns, both on the ground and in the air. He practised range estimation and marksmanship with these weapons. He studied the theory of bombing and the workings of a bomb sight and dropped two score (40) bombs on the Station range. The range was a mile wide to allow for his initial errors; but there were times when the spotters in the range hut found it uncomfortably narrow. For most Observer courses, it was graduation from Bombing and Gunnery School that brought the coveted wing with the big "0." A sergeant's stripes replaced the LAC's propeller. And a sergeant's pay was not unwelcome. The last four weeks of his training in Canada, the observer took at Air Navigation School, at Rivers, Man. or Pennfield Ridge, N.B. There he learned astro as an aid to navigation-to find his way by the bearing of the stars and planets at night and of the sun by day, using the sextant and the blank plotting sheet. There, too, he practised advanced navigation and advanced bombing. Long-range aerial operations and mass bombing attacks were still in the future, and astro-nav. was not rated as highly then as later. In those early days, a wonderful new instrument had just come out, which helped the Observer to establish his position by the stars more quickly. But specimens were rare. '’The instrument, was highly secret at first" in the words of one of the first observer to graduate from the Air Training Plan "and we were taken one by one into a tiny cubicle and shown -- the astrograph." A 20-mile error at a turning point was acceptable at first in training, where later one or two miles became the tolerance. An 8-minute error by dead reckoning against Estimated Time of Arrival would get by. Four years later the tolerance in training was three minutes; while on operations, bomber captains briefed for German targets made bets on the skill of their navigators that would be settled by a difference of seconds from the correct time of arrival at the bombing point. "By contrast with today, we just fumbled along in those days," in the words of the early graduate quoted. But the "fumbling" was good enough that as many of those first Observer graduates finished their embarkation leave, each was assigned as sole Navigator on the trans-Atlantic crossing of a North-American-built bomber being ferried to Britain. From that not inadequate level of performance, the standard of observer training was improved steadily throughout the duration of the Air Training Plan. With the coming of longer-range aircraft and the approach to "1,000 bomber" raids, the navigational responsibilities of the Observer grew steadily heavier. Ever greater accuracy was required, to find small targets in spite of growing difficulties. The navigator had to cope with long distance from base, night, the enemy blackout, fighter opposition, flak, and the puzzle of keeping track of course while the aircraft was weaving madly to avoid being coned by searchlights or boxed by enemy aircraft or detectors. To help the navigator somewhat, constant research was carried on to develop mechanical aids. But these aids themselves called for more specialized training. In the summer of 1942, therefore, the duties of the Observer were divided between two new air crew trades. those of Air Navigator and Air Bomber, or Bombaimer. The navigator was to be responsible only for navigation, becoming "the brains" of the navigation team-a human calculating machine rarely able to leave his desk in the aircraft from take-off until return to base. In training for this, he was to take a 16-week course at an A.O.S., combining the former 12-week A.O.S. and 4-week A.N.S. courses and omitting Bombing and Gunnery school. The new course included 60 hours of day flying and 36 hours of night flight. On graduation, it was the wings parade on his A.O.S. that he received the now "N" wing and his sergeant's hooks. The Bombaimer undertook a double duty. He became the specialist responsible for placing his aircraft's load squarely on target from whatever height might be necessary, by exact target finding and bomb aiming. And he was to be assistant to the Navigator acting as "the eyes" of the navigation team, by supplying positional data obtained through map reading and through use of the sextant, drift instruments, astro-compass, etc. For this he was to train eight weeks at a Bombing and Gunnery school, then pass for six weeks to an A.O.S. for· applied bombing, map reading and navigational training, with emphasis on night bombing, completing some 60 hours in the air by day and night. The new stress on extremely accurate navigation and on specialized training for it was accompanied by a standardizing and tightening of navigational methods. Both the Navigator's and the Bombaimer's courses eventually were lengthened to 20 weeks, to permit still more thorough training. Dead reckoning remained the basic skill, but astro, radio and radar aids became more prominent and ever greater exactness was required. The early student Observers had heard of the astro-compass; their Navigator successors became familiar with it in training. Sextants were improved, synthetic dead reckoning trainers and celestial navigation trainers were introduced. And to begin early the fostering of administrative responsibility, air crew leadership training was added to the course. To free time for the new activities, the old photography and reconnaissance subjects were washed out of the Navigator's syllabus. With the new subjects and the old, went always the routine of physical training, drill, parades and inspections and of maintaining acceptable dress and deportment. Even with changed studies and the longer course, the student's day remained crowded. Through four years at No.7, and to the end despite cheering news out of Europe, the classroom windows of the Ground School building blazed into the night. Behind those lighted windows, students were at work after hours, so keen to do their best that for them the use of the quiet rooms in the evening was truly described by the card upon each classroom door-"Late Study Privilege." Arriving at No. 7 Air Observer School, usually on a Saturday about midday, he climbed out of the bus or truck that had brought him over five miles of dusty gravel road from the railway station, reported in, was taken in charge by two Training Wing Warrant Officer, paraded to the Stores to draw his bedding, then was marched to quarters to be shown his share of a double bunk, and made up his bed. The rest of the Saturday and most of the Sunday, he had to himself. On Monday morning, he was introduced to the instructor assigned to his course. And filled out his personal index card for the Station records. Then he paraded with the others to the Navigation stores in the G.I.S. building, to draw his training equipment. After that, the course paraded to the Recreation hall, where they were welcomed and given wise advice by the Manager, the Chief Supervisory Officer, the Padre, Medical Officer, and the Special Services Officer. A tour of the Station, under the guidance of the instructors, began the afternoon. The student had been in the Air Force for several months before he arrived at A.O.S. and had not yet flown. So, to see dozens of Anson aircraft lining the tarmac was quite a thrill. He also took an eyeful of the coveralled girls handling the gas trucks so smartly, as they refuelled the aircraft parked on the line. The care and use of a parachute and how to bail out of an aircraft were the next topics of his first Monday. Crowded into the parachute room with his course mates, the student listened to a talk and demonstration on this life preserver that probably he never would need, but which he would only need and lack once. The talk and demonstration were given by a woman at No. 7, a fact that invariably amused the new students at first. But amusement changed to respect as they took in the pithy explanation and found themselves quickly outfitted, each with a parachute harness that would accompany him on every flight until he left the Station months later. The taking of a class photo with the new course grouped in front of an aircraft, ended a day that left the new Student well content to roll into his bunk that evening. On the Tuesday, his fourth day on the Station, the student began Ground School classes. Not until a week later were he and his course taken for their first flight, in daytime, to become familiar with the aircraft that would be their flying practice rooms, to get the feel of flight-and to be able to rejoice that, after long weeks in Manning Pool and Initial Training School, at last they were approaching "the real thing." After the four introductory days, the new student found himself settling quickly into a routine of Ground School classes, flights, Physical Training, drill, parades, inspections, games, recreation, and last, but very far from least, meals and snacks. So crowded were his days that he was absorbed in routine almost too quickly to be aware of the fact. For most of the students were so keen, always straining forward to "the real thing," that the mass of training detail was taken in stride in a way that won the warm respect of the instructors. In his training hours, the student progressed from the elements of navigation and the theory of dead reckoning, celestial navigation and the rest to rehearsal in the synthetic dead reckoning trainers, the map reading room, the sextant trainer, and "the silo" or the celestial navigation trainer. From these, he passed to airborne practice on day flights, first, then on night flights, with always greater responsibility. All the time he was becoming ever more conscious of his instruments, particularly of his navigation wrist watch. When he arrived on the Station, a five minute margin seemed punctual enough, and he thought in local time. When he graduated, he thought automatically to the nearest second and in the Greenwich time of navigators the world over, from which he did mental translation to keep local "dates." Working hard for most of his training hours, seven days a week, the student was ready for his "48"-hour leave when it came around every tenth day. A visit to Winnipeg usually made the time pass too quickly. Then it was back to the Station, to press on towards graduation day and the dreamed-of, waiting "O" "N" or "B" wing that would be the proud symbol of his aircrew trade. In addition to the Commonwealth Air Training Plan Museum’s collection of 20+ aircraft and thousands of small artifacts and archival materials, the museum has a collection of 28 motor transport vehicles. 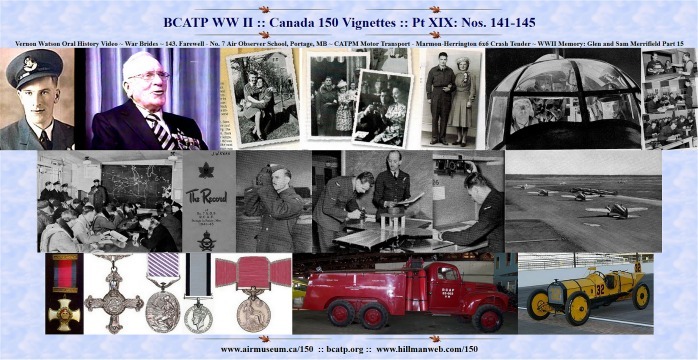 With one exception, they are correct to the period of the British Commonwealth Air Training Plan and a good portion of them had careers with the Royal Canadian Air Force during the war. Included in the mix are three automobiles (Dodge, Chevrolet and Chrysler), one jeep, a Ford three ton fuel tender truck, two SnoGo snowblowers, an International K8 Fire Truck, International K Series two ton truck, International K Series Panel Truck, International K Series panel truck, Dodge two ton truck, Dodge one ton fire truck, Chevrolet two ton stake truck, International and Ford tractors and a D2 caterpillar. A most impressive member of the CATPM motor fleet is a 1944 Ford 6X6 (all-wheel-drive) Marmon Herrington Crash Truck. The story of the Marmon Herrington Company is fascinating as well. The Marmon-Herrington Company of Indianapolis, Indiana got its start as the Nordyke and Marmon Machine Company, founded in 1851 to produce flour milling equipment. It morphed into the Marmon Car Company in the early 1900s to produce high-end automobiles for 30 years. 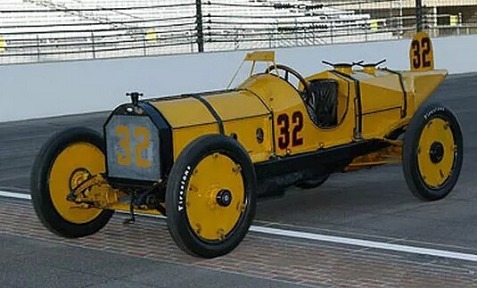 It was the Marmon Wasp which won the first Indianapolis 500 race in 1911 in almost seven hours and with an average speed of 74 miles per hour. 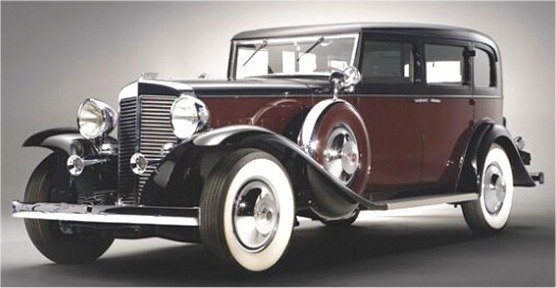 When the worldwide economic depression of the 1930s caused massive closures and bankrupting of businesses throughout the world and severe unemployment and economic hardships for most people, demand for the prestigious Marmon cars disappeared. To evade a fate similar to thousands of other companies, the Marmon Company merged with an ex-military engineer named Arthur Herrington, in 1931, to produce rugged and dependable four-wheel-drive vehicles for the military and limited civilian use. The first vehicles off the production line were designed for towing military weaponry. In most cases, the Ford Motor Company provided basic, heavy trucks which were fitted with Marmon-Herrington mutli-axle drivetrains. Many years before the American Willys company developed the well known four-wheel drive Jeep for military use, the Ford Motor Company and Marmon-Herrington company were collaborating to make four-wheel and six-wheel-drive trucks. The collaboration came about when Ford realized the folly in re-inventing drive train technology already available from Marmon-Herrington. Ford had been unsuccessful in the production of these drivetrains. These trucks were a big hit with military customers all over the world. The first Ford/Marmon-Herrington vehicle produced for the Canadian military during World War II, was a 4x4 truck customized to meet the needs of the army. The air force also acquired fuel tenders for use at its many aerodromes across the country. This truck and the three-ton, six-wheel-drive crash tender were not customized to Canada’s needs, but were already in production for a number of armed forces across the world. The RCAF acquired the 6x6 in great numbers to serve at its aerodromes across Canada. They were very capable of responding to fires and crashes on RCAF property as well in fields and other off-road locations adjacent to, or near the airfields where conventional vehicles could not travel. These trucks were equipped with fire-fighting equipment supplied by the Walter Kiddie or American La France companies. A typical configuration included a water tank and pump, foam developing equipment (mechanical and chemical) and carbon dioxide cylinders. The CATPM Marmon-Herrington crash tender was built in 1944 and was stationed with the RCAF during the war. It is currently roadworthy and has most of its fire-fighting equipment mounted on the truck although it is non-operable. After the war, other Marmon-Herrington ventures included the development of military tank drive units, airport fire trucks and trolley busses from 1946 to 1959. The company continues to produce transfer cases and axles for trucks and specialty vehicles. It is now one of the many successful corporations owned by the Berkshire-Hathaway company. In this final installment of "Brothers Two, Dressed in Blue, In World War II" Glen Merrifield recounts his, and brother Sam’s, final days with 405 Squadron in England, their trip home to Canada and final days in the RCAF. He also discusses the achievement and honours earned by his Pathfinder Squadron. some overseas time to give them a chance to remain in the service. To make a place for them someone needed to come home. The bait they offered was to go home, get an early release which is available, and get into University ahead of the crowd. After a pep talk by the Engineering Officer we felt this was too good to pass up so we accepted. consider it a high honor and a great privilege to have served with so many fine people. Paramount among those were our aircrews, whose fine record placed them first among all Canadian Squadrons in the Second World War. Because I was not part of the flying duties I feel free to boast about the exploits of my fellow squadron members who were. Our squadron awards as listed in the book "RCAF" by Kostenuk and Griffin are; 9 DSOs (Distinguished Service Order), 24 bars to DFC (Distinguished Flying Cross), 161 DFCs, 38 DFMs (Distinguished Flying Medal) 1 CGM (Conspicuous Gallantry Medal), 2 BEMs (British Empire Medal), 11 Mid (Mention in Dispatches). Our Battle Honours are; Fortress Europe 1941-1944, France and Germany 1944- 1945, Biscay Ports 1941-1945, Ruhr 1941-1945, Berlin 1941; 1943 - 1944, German Ports 1941-1945, Normandy 1944, Walcheren Rhine, Biscay 1942- 1943. That's eight, the maximum allowed on a Battle Honors Flag. The Bomber War Diaries on page 763, states under POINTS OF INTEREST: First Canadian squadron in Bomber Command and the only Canadian Pathfinder squadron, carried out more bombing raids than any other Canadian Squadron. Carried out most Wellington bombing raids in 4 Group. Carried out an unusually high proportion of bombing raids throughout its career and suffered heavy causalities the only long-serving heavy squadron not to have flown any mine laying operations. The 9 DSOs will take their rightful place when I state that Canada had 46 squadrons overseas in WW2 and they won 44 DSOs in total .. two other squadrons won 4, less than half our number. Canada's 16 single engine fighter squadrons won four between them. This glory did not come without a fearful price. The same book shows an operational loss of 167 aircraft. More than nine times our full squadron compliment of 18 aircraft. York on November 25. Our trip back across the Atlantic was slow because the ship was being sent to the USA to have a bent propeller shaft repaired. We sailed by ourselves, out of convoy, because the U-boat threat was nearly over at that point of the war. The word 'nearly' caused us some concern but the dispatcher knew his business and we landed in New York on December 4, 1944. My memory of food has stayed with me and I have often stated that my first meal on the Aquitania as the best of my life . It was far from fancy but we could have ALL WE WANTED, of wieners, white bread, butter, jam, sugar and ketchup. After four years and two months of disciplined eating it was a highlight. We entrained in New York for Ottawa where we arrived at Rockcliffe on December 12. Our father was in Ottawa and came to Rockcliffe to pick us up. The next day Jack proceeded on to Vancouver where his family had moved during his time overseas. Sam and I remained in Ottawa with Dad through Xmas and took the train to Wolseley, our Saskatchewan hometown, for New Years. The Citizens Committee who had sent us parcels all through the war were planning a homecoming, which they gave all vets, and we gave them mid-January as a date to plan towards. We proceeded out to the west coast and visited relatives in Nanaimo. When we met Jack Duller in Vancouver he informed us he had a telegram asking us to remain at the west coast and report to Jericho Beach Station. This spoiled the Wolseley plans so we somehow lost the telegram and entrained back to Rockcliffe where we arrived on January 13, 1945, our month's repatriation leave at an end. The repat depot had been moved to Lachine so we carried on and arrived there on January 15. They gave us tickets back to Jericho Beach and we headed west, stopping in Wolseley for a couple of days to enjoy our "Homecoming". It was quite a "do". A sit down dinner for most of the town, followed by a dance with speeches by the local MP, MLA, and Mayor, and a letter of thanks for our service. This committee planned to buy all the returning vets a gold commemorative ring but we declined and asked them to give their substantial surplus funds to a worthy charity. I cannot speak too highly of the support this town gave its service members. Our local cenotaph lists 16 names from the Second World War, More than ten times the Canadian average. In a small community where everyone knows everyone else by name and family these losses are very personal. We proceeded on out to the coast to Jericho Beach and were put on charge for being two days overdue. The first and only charge of the war over something that would have rated no more than a blast from your chiefie overseas. We attempted to pursue the early release promise and found it fell on deaf ears. We were reminded to be sure and observe the "attention zones" etc., etc. and we were kicking ourselves for coming home when we learned our friend Rev. Stewart still in the Air Force, was living in Vancouver. We looked him up in the phone book and found him listed under Wing Commander Stewart, and he invited us to his home for Sunday dinner. We explained our problem to him and his position ensured our release which took place for Jack and I on February 21, 1945 and Sam on the 22nd his records arriving later than ours. Our service ended with my still being the senior in military terms, (I had joined ten minutes earlier) and Sam being the longer serving by one day. In 1970 my wife Eve and I attended the Battle Flag presentation at CFB Greenwood N.S... My list of attendees from that reunion allowed me to raise funds and have our squadron crest placed in St Clement Danes Church the following year. Many of us got together in 1980 in Toronto for the 40th Anniversary Reunion of the Battle of Britain. Sam and I attended the Allied Airforces Reunion in Toronto in October 1987 which featured 405 Squadron. As I write these closing lines my second wife Rose and I are a little over a month away from leaving for the UK to attend the Memorial Window Presentation at Gransden Lodge. I salute any who have the patience to read through to this point. May your life be filled with as many pleasurable memories as mine has been. 1. Distinguished Service Order – awarded to members of the armed forces who gave "Distinguished services during active operations against the enemy." Over 15,000 awarded since September 1886, from Queen Victoria’s reign to the present, Britain and all Commonwealth Nations, generally awarded to senior officers (Major and above) but sometimes given to junior officers. 2. 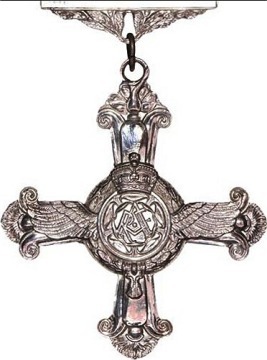 Distinguished Flying Cross (DFC) – awarded to British Commonwealth and allied forces for "exemplary gallantry during active operations against the enemy in the air," established in June 1918 under the reign of King George V, 32,844 awarded to the present day. 3. Distinguished Flying Medal (DFM) – awarded to British, Commonwealth and allied forces for below the commissioned rank, for "exceptional valour, courage or dedication to duty whilst flying in active operations against the enemy," initiated under reign of King George V, discontinued in 1993. 4. Conspicuous Gallantry Medal (CGM) – awarded to British, Commonwealth and allied forces for "gallantry at sea or in the air," for ranks below commissioned ranks, discontinued in 1993, established in July 1874, Queen Victoria’s reign, 359 awarded. 5. 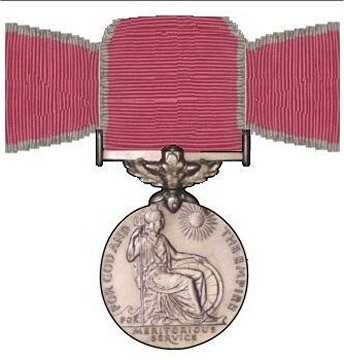 British Empire Medal – awarded for meritorious service or military service worthy of recognition by the Crown, established in 1922 to current day, 2015 awarded. Mention in Dispatches – awarded as an official report written by a superior officer and sent to the high command, in which gallant or meritorious action in the face of the enemy is described. May or may not be associated with the award of a medal.